getcalc.com's Complex Numbers Arithmetic Calculator is an online basic math function tool to perform addition, subtraction, multiplication & division between two or more complex numbers or expressions in the form of a + bi. 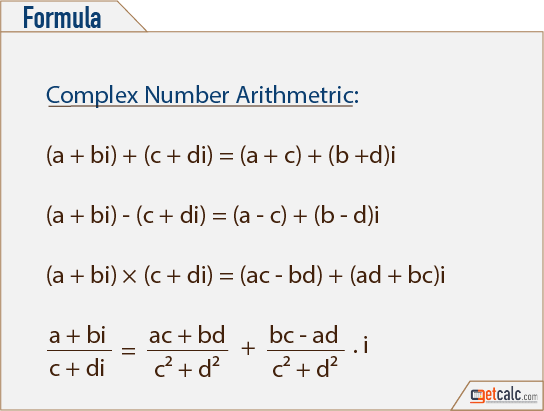 Complex Number is a a basic mathemetic function, generally an expression containing having both real & imaginary parts, often represented by a + bi. "a" represents real part and b represents imaginary part in the complex expression. Whereas, the complex number arithmetic is the addition, subtraction, multiplication & division operations between two or complex numbers.